We are a leading Manufacturer of fluid bed dryer filter bag from Indore, India. 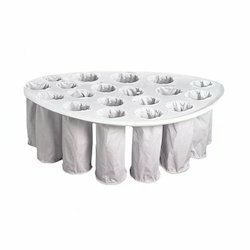 We are the leading manufacturer and supplier of a distinct range of Fluid Bed Dryer Bags. These are used in various industries such as pharmaceuticals, chemical industry, beverage, food, etc. These are manufactured using high grade of raw material which is procured from our trusted vendors. We do complete quality and performance measure of these Fluid Bed Dryer Bags under certain parameters ensuring excellent performance, high durability and reliability.